In Bavaria, the Munich Oktoberfest is referred to as "Die Wiesn" (the meadows), after a large meadow of sorts it takes place on, the Theresienwiese. Watching over all the cavorting is the statue of...? You guessed right, Princess Theresa, who married Crown-Prince Ludwig I here in 1810. Confused? But wait, there's more! It doesn't start in October, but runs through the last two weeks in September and the first week of October. Which happens to be one of the nicest times of the year in Bavaria; a Bavarian Indian Summer of sorts. To limit the confusion somewhat, the Munich newspaper Süddeutsche Zeitung, sz for short, published two very helpful guides. 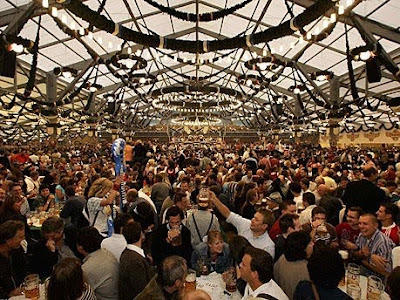 One is in English – The Wiesn-Alphabet, from Anbandeln (flirting) to Zelt (tent) – the other one (even better in my opinion) is in German: an interactive map of the beer-tents, explaining the characteristics of each tent and what's going on there - once you make it in, that is.